Russian court sentences Jabhat al-Nusra member to 7 years in prison | Russian Legal Information Agency (RAPSI). ST. PETERSBURG, February 16 (RAPSI, Mikhail Telekhov) – The Moscow District Military Court’s judges during a visiting session in St. Petersburg sentenced a native of Kyrgyzstan Islamdzon Zakhidov to 7 years in prison for fighting in Syria on the side of Jabhat al-Nusra terrorist organization prohibited in Russia, RAPSI reports from the courtroom on Thursday. Prosecutor earlier demanded a 10-year prison sentence for Zakhidov. The court found that Zakhidov arrived in Turkey in December 2014. Later, in February 2015, he left for Syria and joined Jabhat al-Nusra. He underwent physical and psychological training, gained weapons skills, experience of warfighting, skills for handling tanks and tank gunnery in a terrorist training camp. Shortly afterwards, he carried out patrol of territories close to Aleppo, Idlib and other Syrian cities, according to case papers. The court took into consideration that Zakhidov at that time was a minor and left for Syria on insistence of his father Sadyk Zakhidov, who is currently fighting in Syria as an active Jabhat al-Nusra militant. Investigation into the case was conducted by investigative service of the Federal Security Service (FSB) Directorate for St. Petersburg and Leningrad Region. According to law enforcement authorities, a criminal case was also launched against Zakhidov’s father and other Syrian-based members of the family. 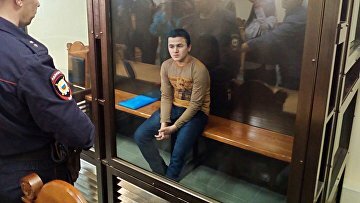 17:01 16/02/2017 The Moscow District Military Court’s judges during a visiting session in St. Petersburg sentenced a native of Kyrgyzstan Islamdzon Zakhidov to 7 years in prison for fighting in Syria on the side of Jabhat al-Nusra terrorist organization prohibited in Russia.